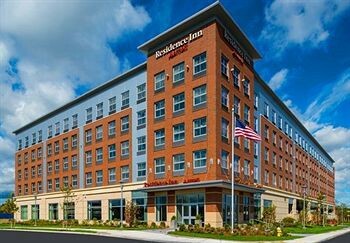 Property Location With a stay at Residence Inn Boston Needham in Needham, you&apos;ll be within the vicinity of Boston College and Bentley College. This hotel is within the vicinity of Alumni Stadium and Jackson Homestead and Museum.Rooms Make yourself at home in one of the 128 air-conditioned rooms featuring kitchens with full-sized refrigerators/freezers and stovetops. Wired and wireless Internet access is complimentary, while 37-inch flat-screen televisions with cable programming provide entertainment. Conveniences include phones, as well as desks and microwaves.Rec, Spa, Premium Amenities Be sure to enjoy recreational amenities including an indoor pool and a 24-hour fitness center. Additional amenities include complimentary wireless Internet access, a fireplace in the lobby, and a television in the lobby. Guests can get around on the complimentary shuttle, which operates within 3 mi.Dining Grab a bite from a grocery/convenience store serving guests of Residence Inn Boston Needham. Mingle with other guests at a complimentary reception, held on select days. Quench your thirst with your favorite drink at a bar/lounge.Business, Other Amenities Featured amenities include a 24-hour business center, a computer station, and express check-in. Planning an event in Needham? This hotel has facilities measuring 1330 square feet (120 square meters), including meeting rooms. Free self parking is available onsite.